from the unattached list for the Territorial Force, serving with the Repton School Contingent. He then served in France, 1916-1918 with the Royal Field Artillery. 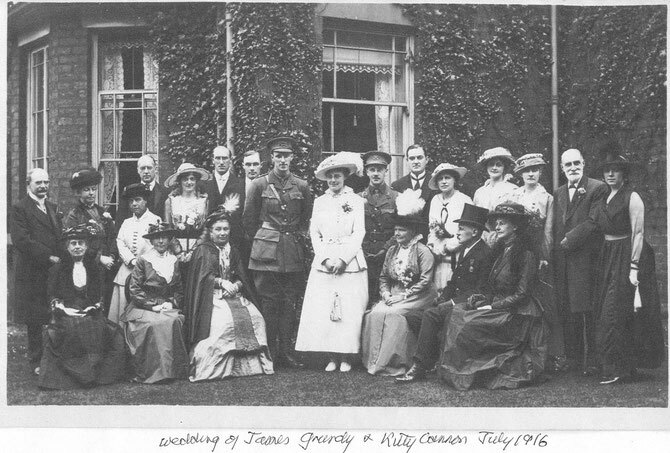 Standing: Herbert Knowles, Alice Mather (groom's aunt), unknown, Wilfred Grundy (brother), woman, man, man, James Grundy (groom), Kitty Cannon (bride), Geoffrey Grundy (brother), Francis Grundy (brother), Beatrice Cannon (sister), Gladys Hunter, Miss Heborter [? ], unknown, unknown.